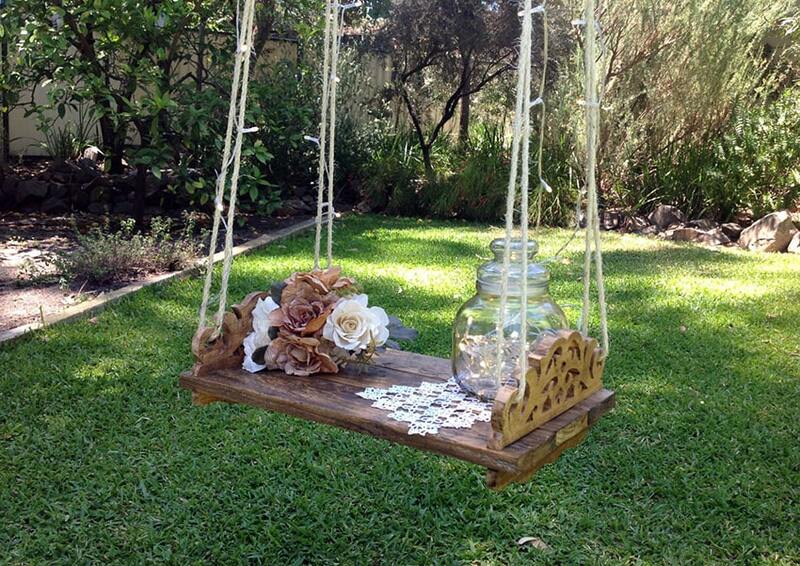 Welcome to our gallery of creative wood pallet ideas. 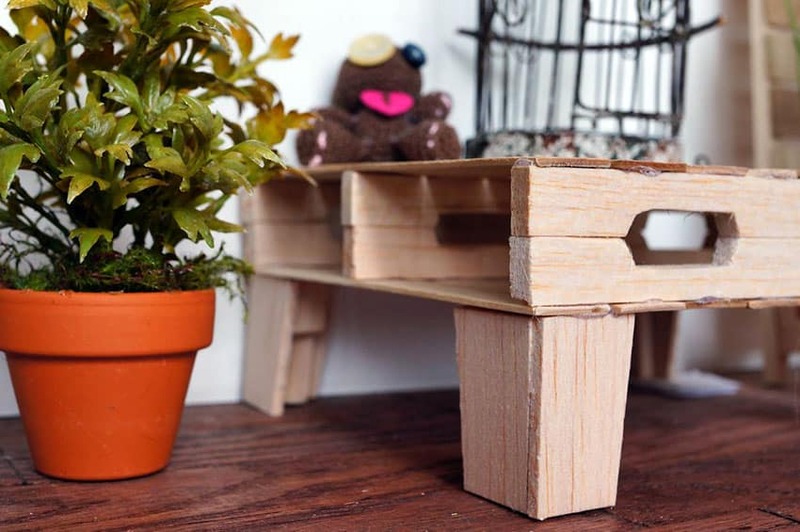 There’s a new trend in design which recently becoming very popular across the planet – it’s repurposing and recycling wooden pallets; and making them a useful resource in furniture making and home DIY projects. Since these pallets are readily available and can be sourced almost anywhere, they have low upfront cost compared to other wood materials. 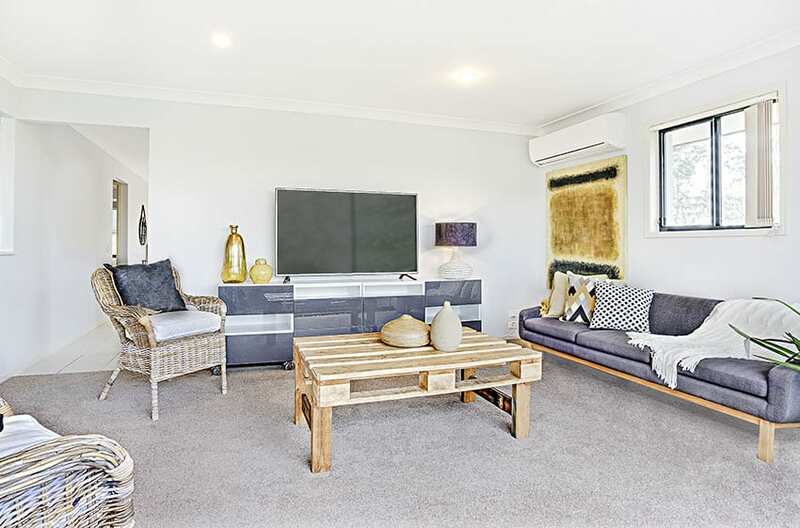 Wood pallets are very easy to be disassembled, recycled and turned into fantastic furniture pieces, wall coverings, flooring, home furnishings and accessories. 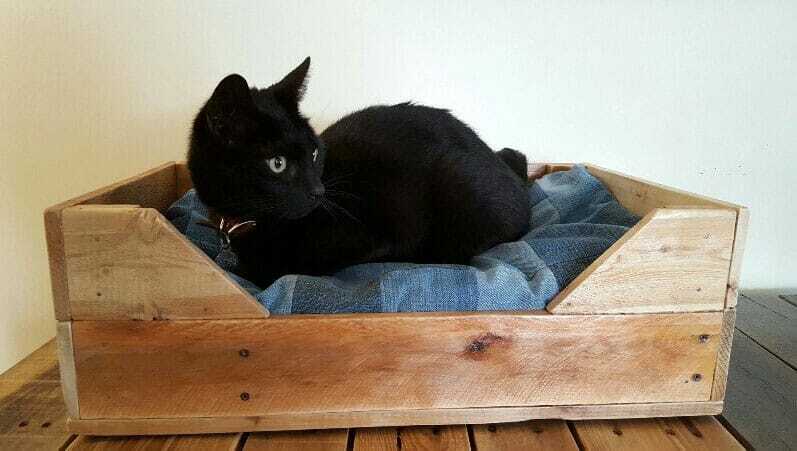 Below we’ll showcase some of the inventive ways wood pallets are being used in and out of the home. 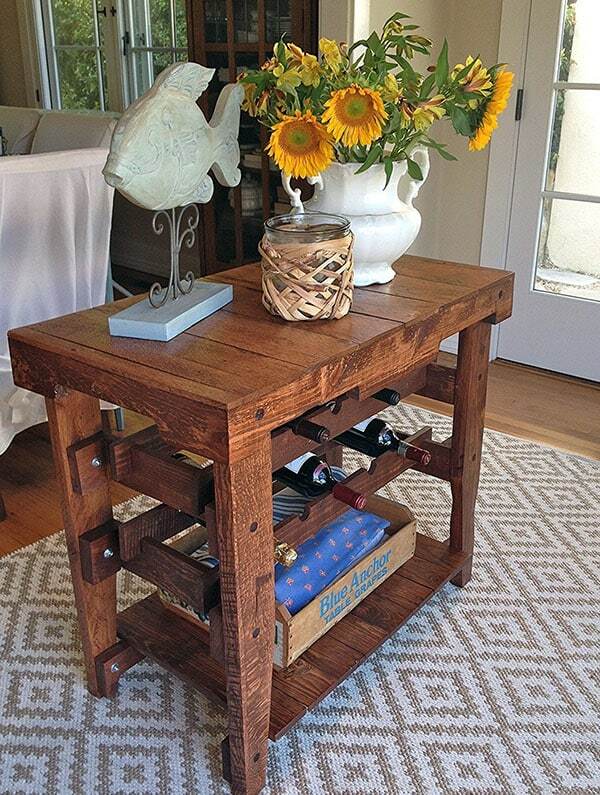 The rustic center piece coffee table shown above was made using two wood pallets. 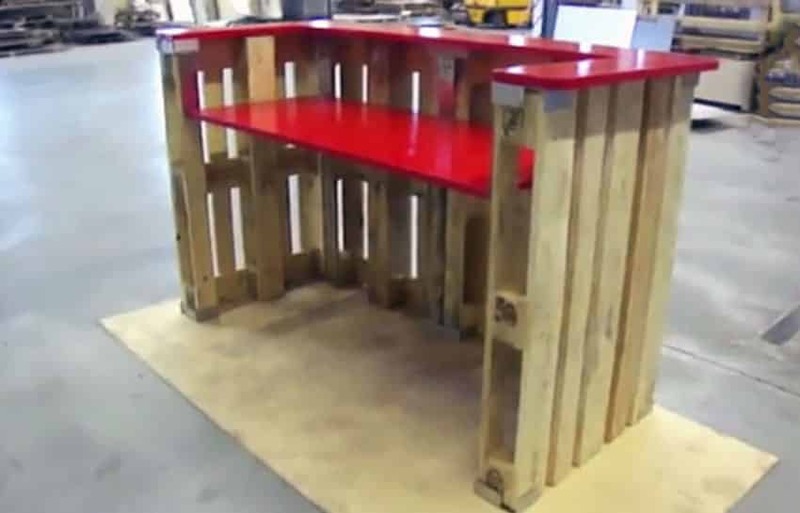 The table top is made out of the stringer pallet incorporated with two drawers and the block pallet is used for the bottom layer for more storage space. Distressed paint finish is applied to feature a more country style look. Wood pallets are well-known to being used for shipping and storage. The pallet provides support for assembling, storing, handling and transporting of different materials and products. There are two styles of wood pallet – single faced also known as “skid” are often non-reversible or double face wood pallet wherein either side can be used for the top deck. The most common pallet size or pallet dimension in North America is 48×40 inches. Wood pallets has certain characteristics which proves to be one of the best choice for home décor and furnishing. Strength – the term applies to the load bearing capacity of the pallet to support weight. 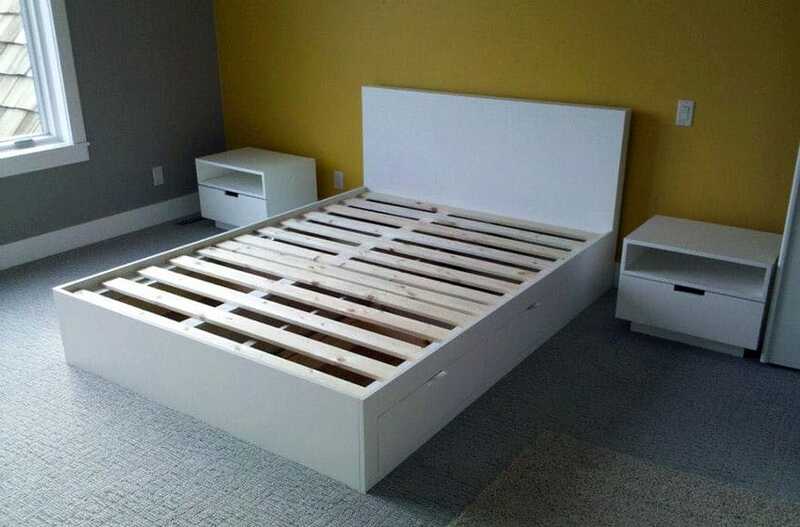 This quality is very important thing to consider in making furniture. Stiffness – the term applies to the pallet’s ability to withstand changing shape such as bowing, concaving or breaking down under load or movement. Stiffness is an essential partner to strength. Durability – this term applies to the pallet to sustainability to be exposed to different types of environment; such as the outdoor weather. 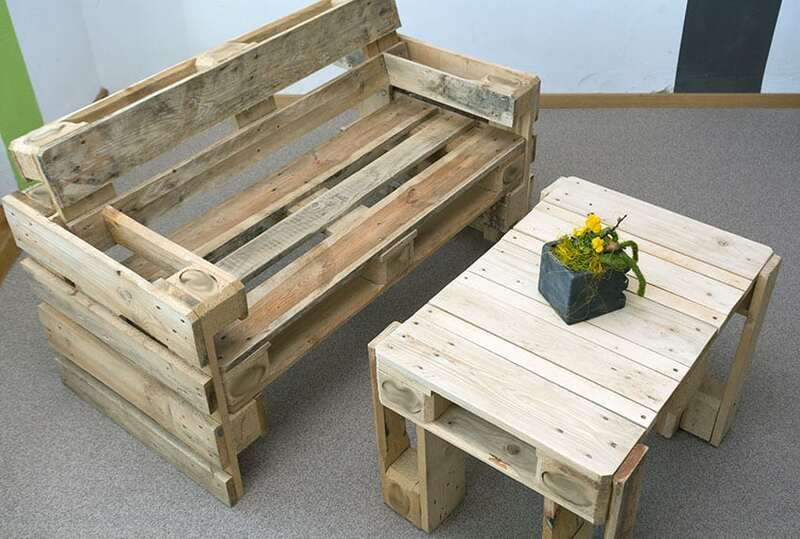 There are other sources where you can get low cost or free wood pallet for your home projects – these are the scrap pallets which can be recycled. These scrap pallets, commonly known as pallet “cores” can be sourced in various places such as recycling companies or pallet collectors if you require large quantities. There are other options to consider as well, such as sourcing them from online or print ads offering free pallet removal. You may also try to source from schools where they generate small quantities of pallets from shipment of their books and other school supplies. Small businesses such as gas station, convenience stores, groceries or fresh produce markets are some of the best places to source wood pallets. 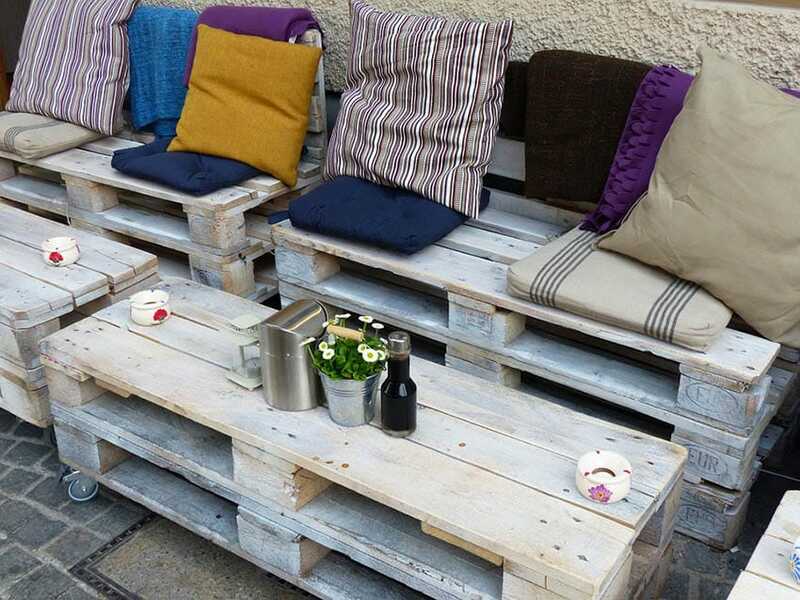 Wooden stringer pallets are assembled and designed to create this pallet cubic tables and rustic outdoor lounge which blends well with the whole design concept. Light tone wood stain finish is applied particularly for outdoor use. 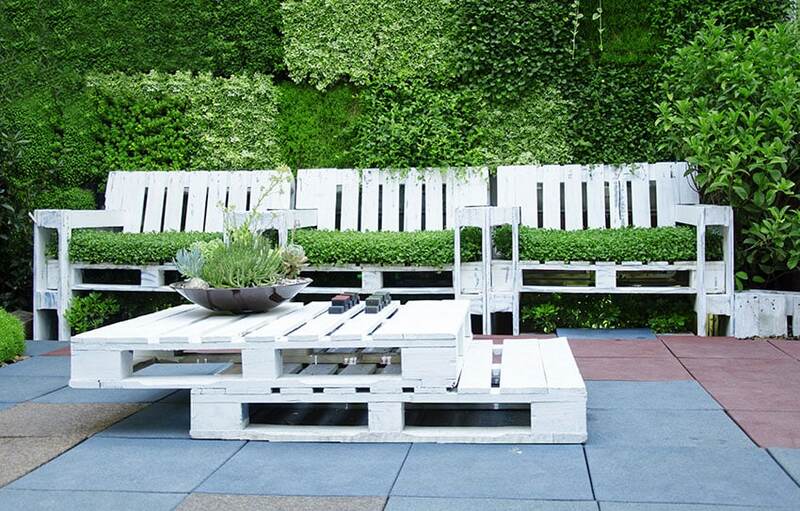 Wooden pallets are also used for the deck flooring. 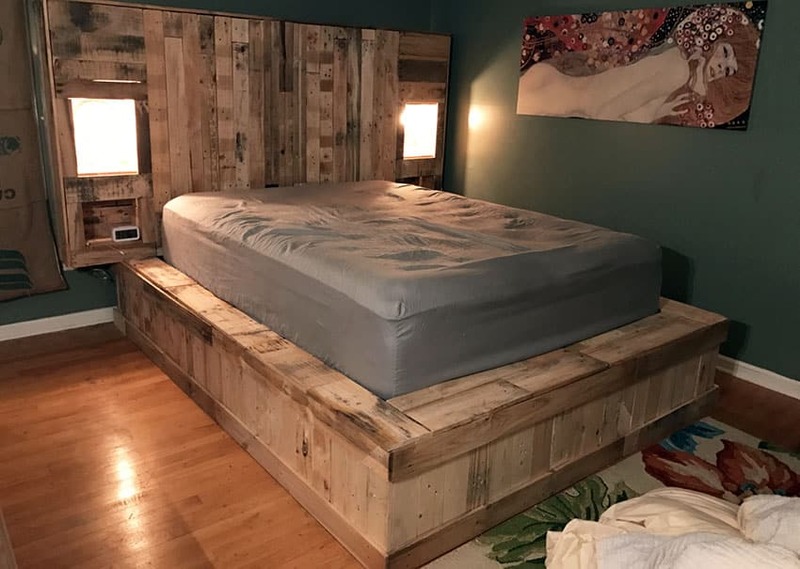 In this article, we want to showcase awesome furniture ideas using recycled wood pallets and inspire you to create your own unique designs. Pallet wood flooring can be an outstanding DIY project you could do for your home, adding random texture and unique patterns. 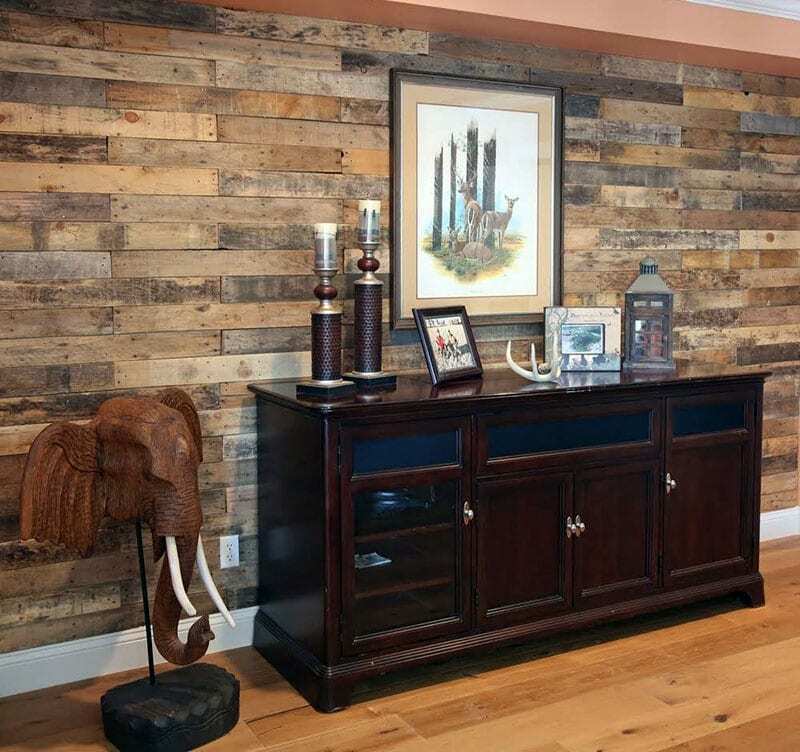 Accent interior walls made by using wood pallet pieces adds a more rustic look to your design scheme. Functional furniture pieces such as wood pallet kitchen island, bookshelf, coffee and side table, dining table, chest of drawers, laundry basket dresser, daybed, swing bed, outdoor bar, lounge and outdoor furniture set. 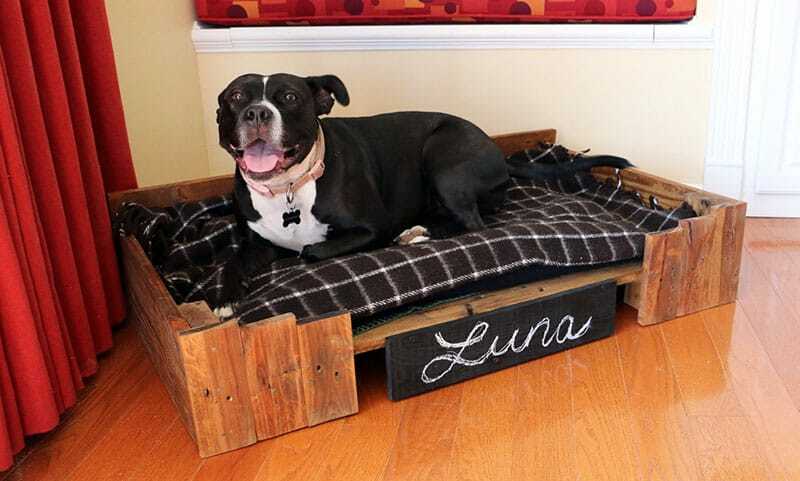 Have fun and express your creativity in using wood pallets for wall arts, embellishing accent pieces, toy box for storage, wine rack, wooden pallet mailbox, doll house or a replica of a castle, swing chair, reading nook, pet beds, plant box, garden tool organizer, wood pallet fence, shoe and bike rack. 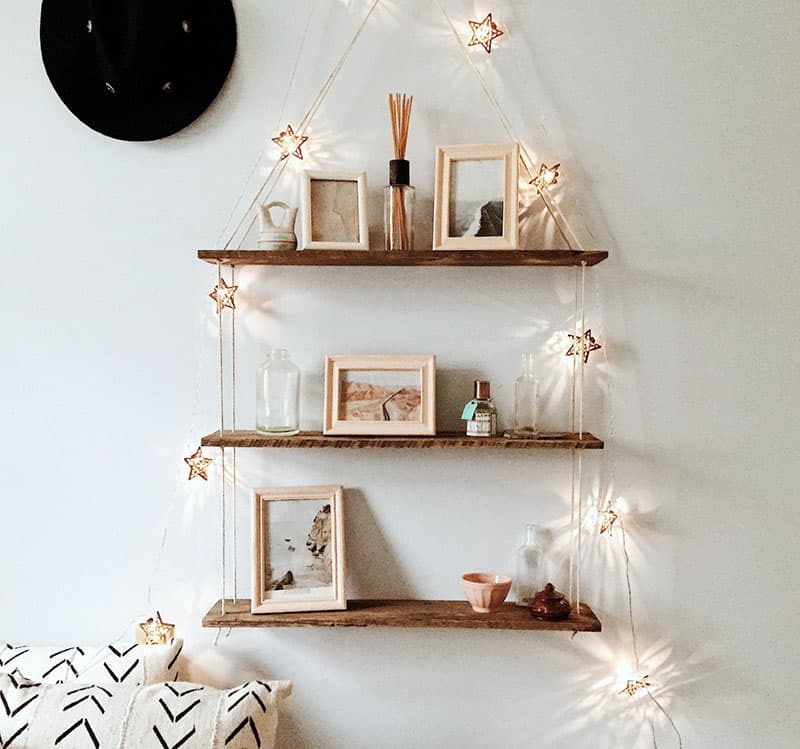 Here are some of the best wood pallet ideas for home decoration and to get the perfect inspiration for a stylish project with a limited budget. A simple coffee table made use of a block pallet for the table top and another block pallet for bottom support. In between the table top and bottom support are dismantled pieces of a pallet uniquely designed to incorporate more storage space. Dark brown wood paint finish is applied to achieve a very sophisticated style. 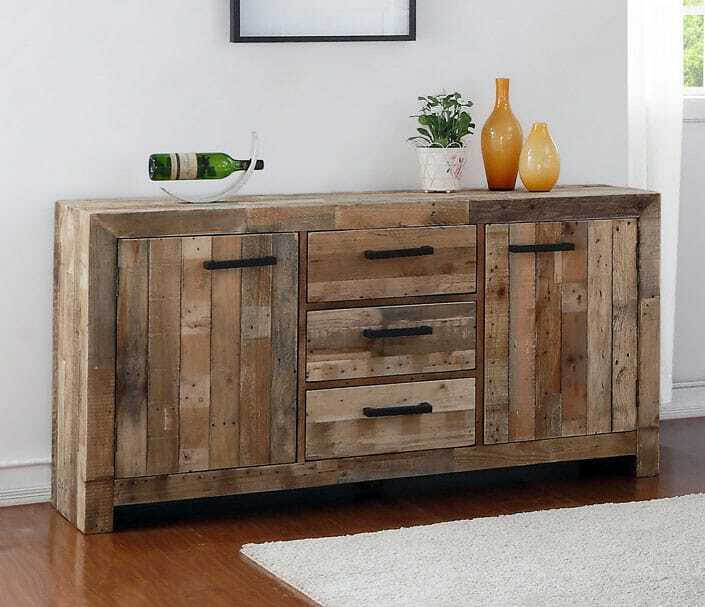 This stylish sideboard buffet cabinet is made from reclaimed wood shipping pallets. The buffet is treated with a light stain to enhance the natural look of the knots in the wood and natural variation in the grain patterns. 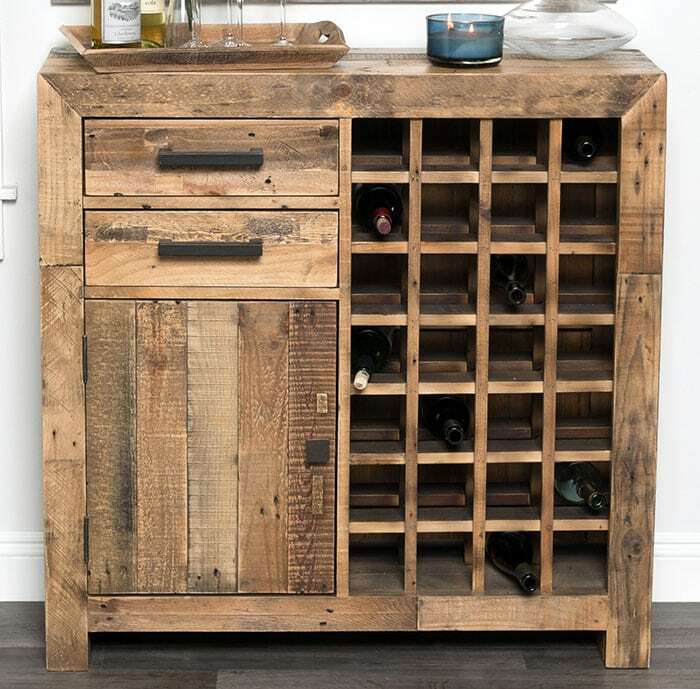 This wine cabinet is constructed using all reclaimed pine wood pallets. It features storage for wine bottles as well as storage and a countertop for drink preparation. 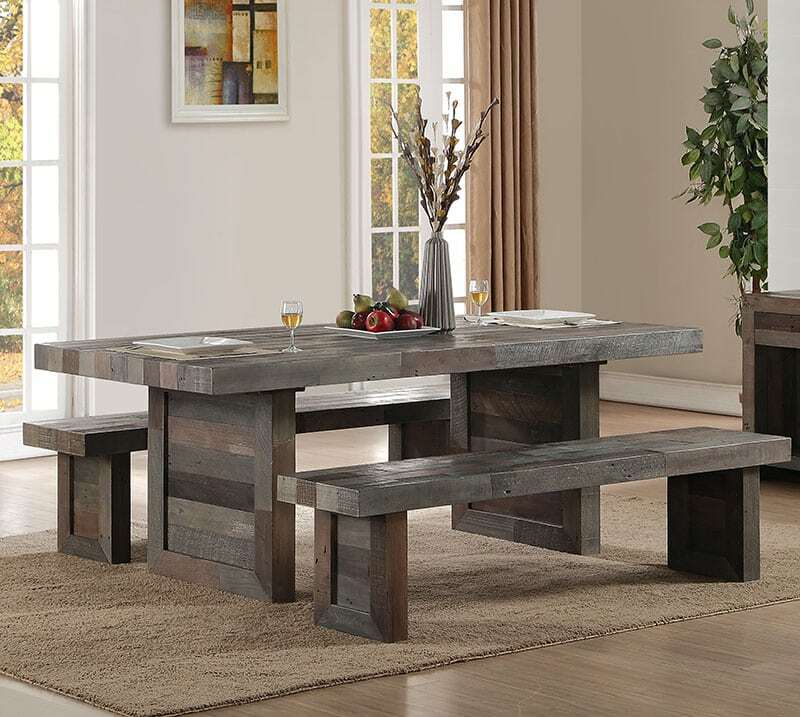 This dining table is made from reclaimed pine wood pallets and features a distressed charcoal stain to give it an appealing rustic look. Tables are essential pieces of furniture for the home. 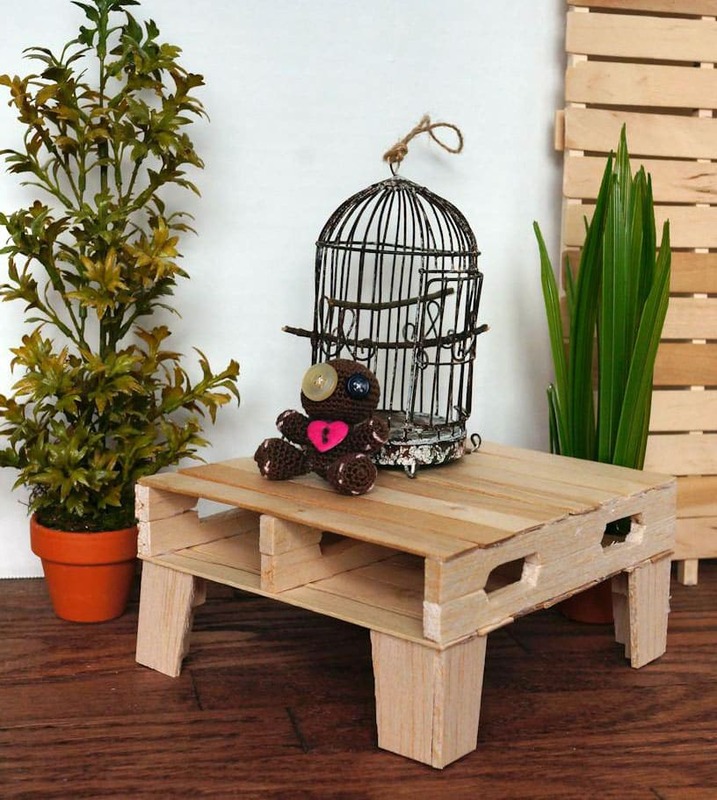 This skid wood pallet table in natural wood oil incorporates refurbished crate wood for the legs attached by heavy duty bolts for a sturdier character; perfect for entertaining family and friends. Here’s an extremely easy to build multi-purpose table made with two stringer wooden pallet with the bottom side stacked and screwed on top of the other. 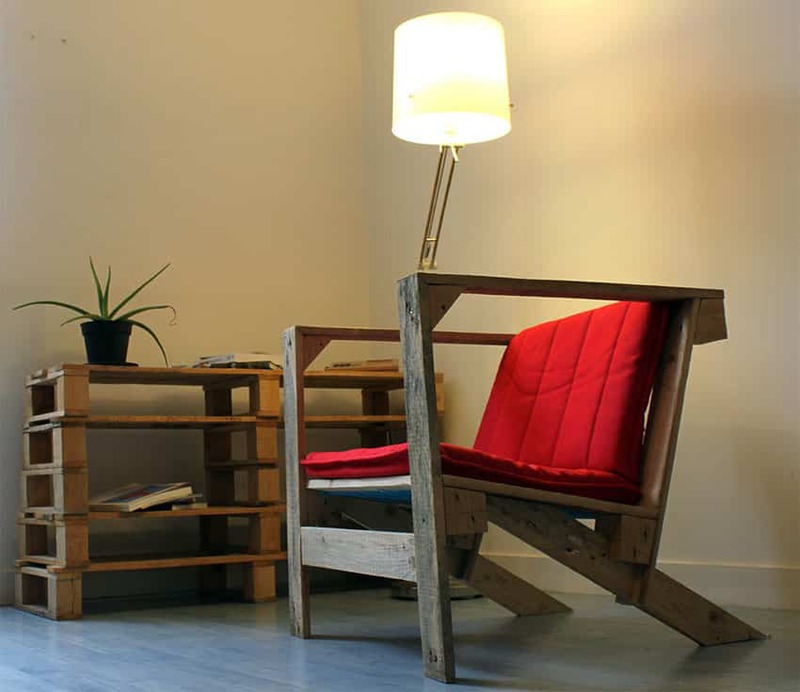 The custom-made legs are made of disassembled wood pallet cut to the owner’s desired height. This is another version of a multi-purpose table which can be used as a coffee table or side table. 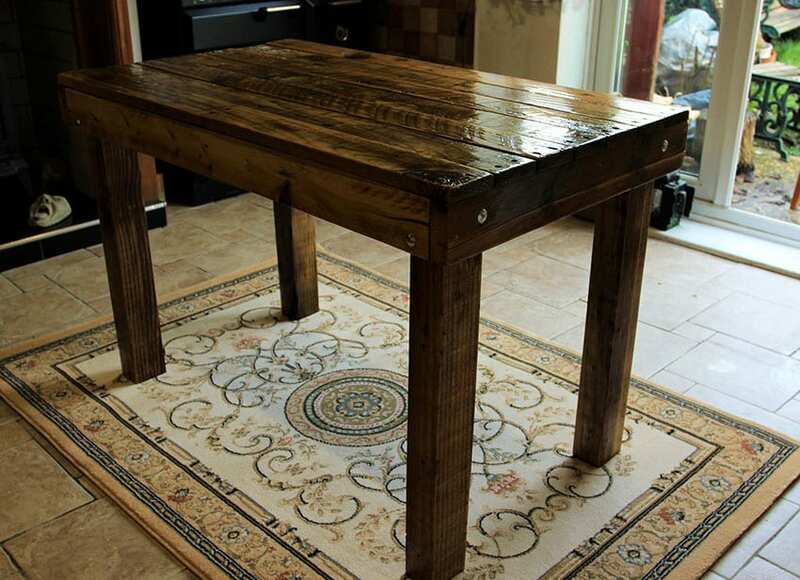 Made of two skid wooden pallet with the runner joined together to create the table top. 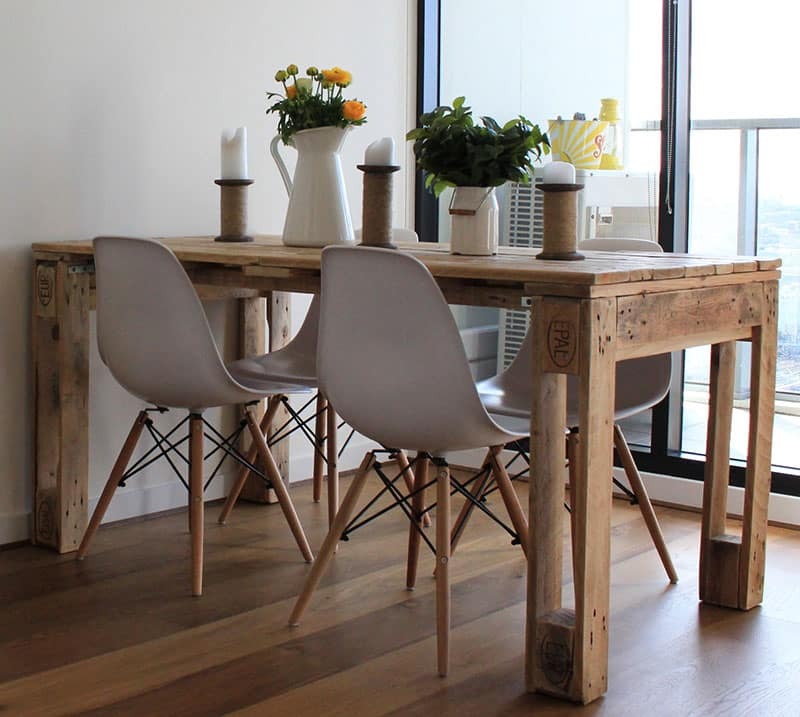 The table legs are made from disassembled wood pallet. Customized chair and console table made from salvaged pallets gives this neutral toned space a rustic edge. 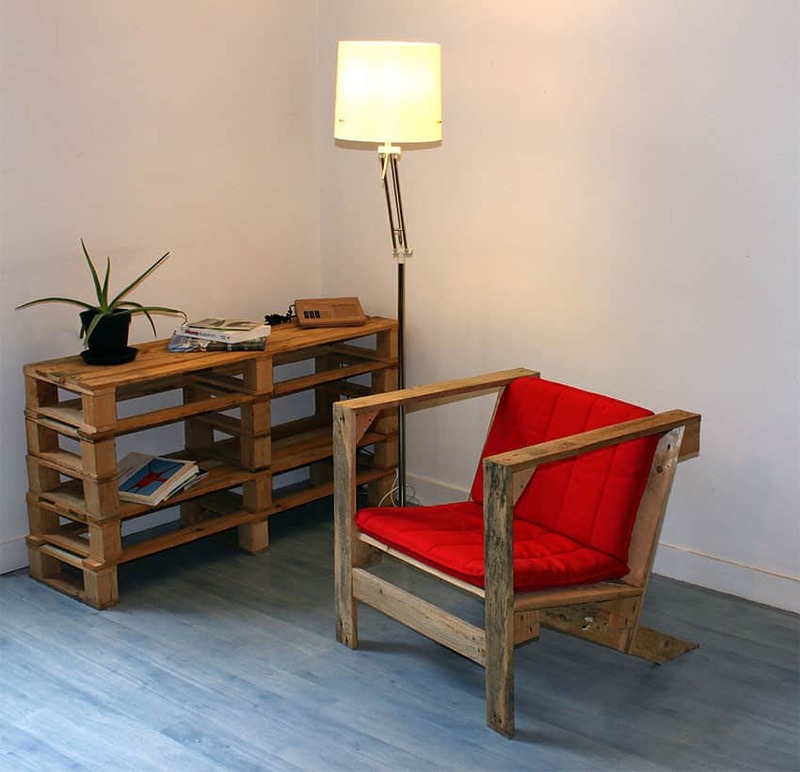 A splash of red cushion adds comfort to this reclaimed wood pallet arm chair. Repurposed stacked wood pallet console table compliments this trendy arm chair which achieves a relaxed and laid-back design scheme. Custom built office tables can be very costly. 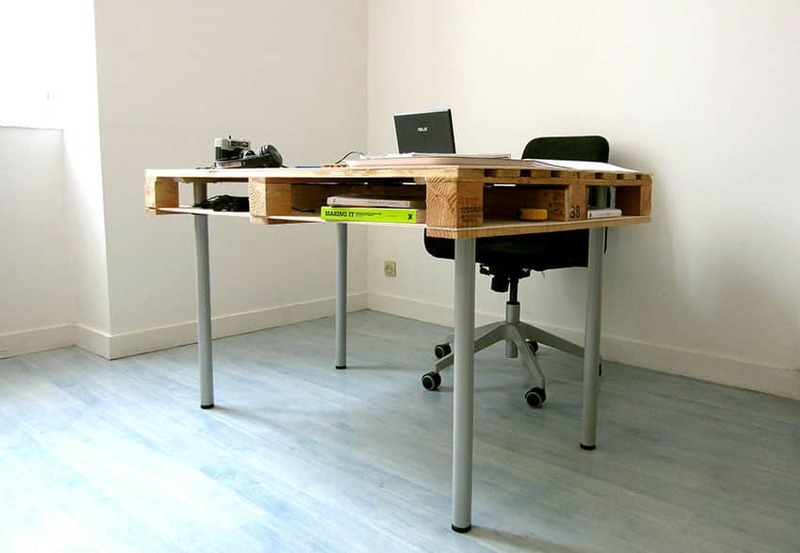 Be inspired to make your own desk by using wooden pallets. This computer desk made use of a stringer wood pallet which was sanded, powder coated metal legs which can easily be bought at any hardware or home depot, and a sheet of plywood for bottom support and extra storage space. 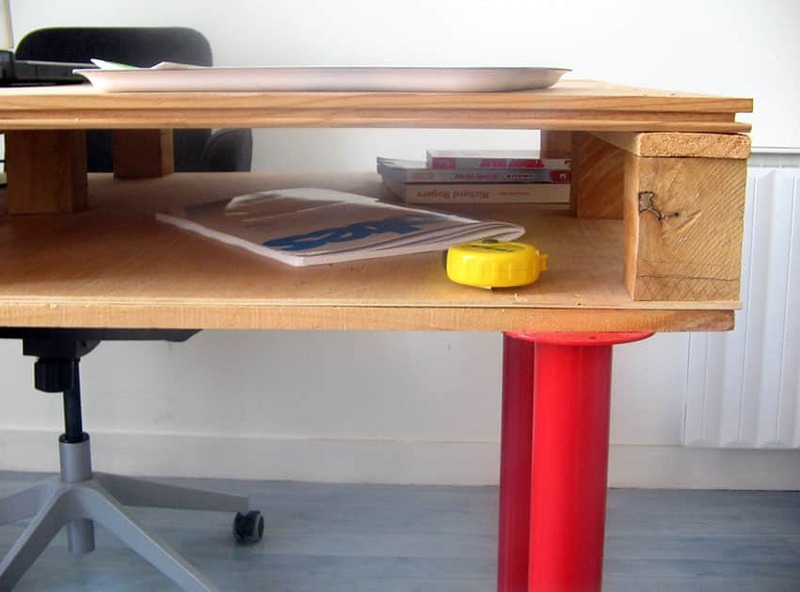 This office desk is made out of a block wooden pallet and pieces of plyboard for additional storage space and additional base support. The office table’s legs are made from powder coated metal legs screwed beneath the top deck board. 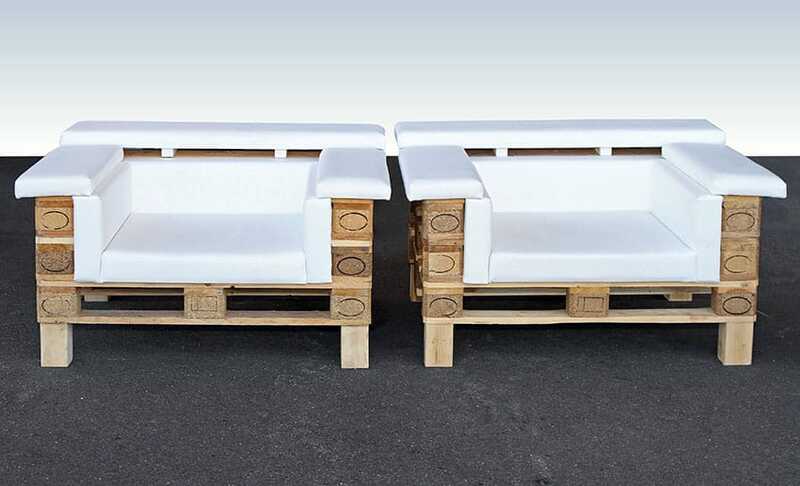 Do-it-yourself cushioned arm chair combines modern design trend with a rustic touch giving this wood pallet furniture set a unique character. 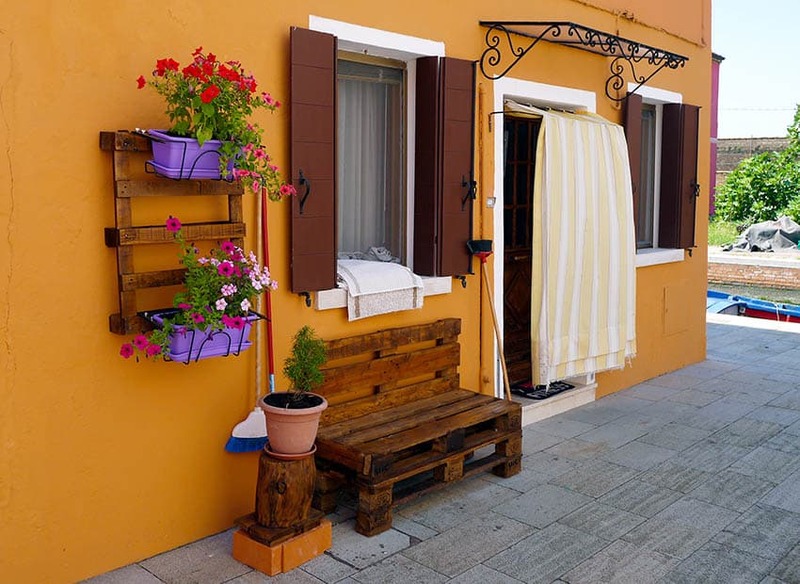 This rustic pallet chair is stained to match the hanging pallet planter box and gives this outdoor entrance a touch of charm. 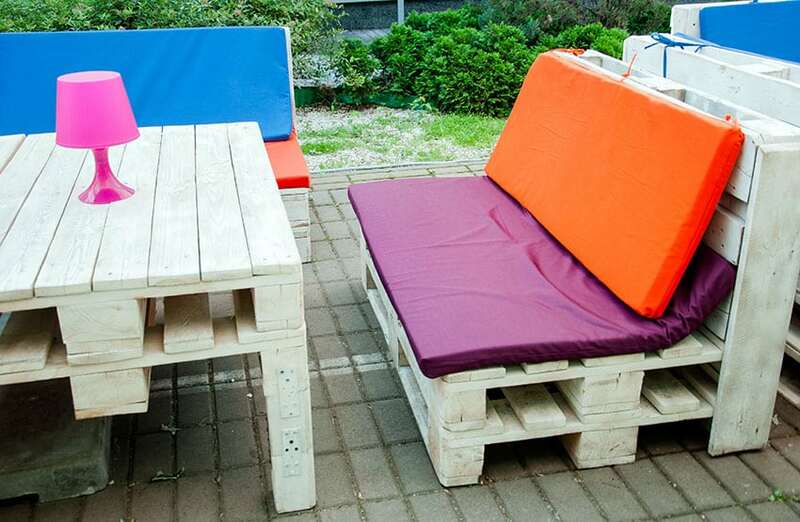 This is a no frills DIY pallet lounge chair and rolling table you can create yourself. Make sure to add plenty of comfy cushions to brighten things up and add a pop of color. Repurposed wood pallets give this custom-made DIY chair a new form and design from its humble beginnings of just a piece of pallet used to hoist goods. Inspiration for a rustic chair and coffee table made from reclaimed wood pallets, stacked, sanded and sealed with natural varnish. 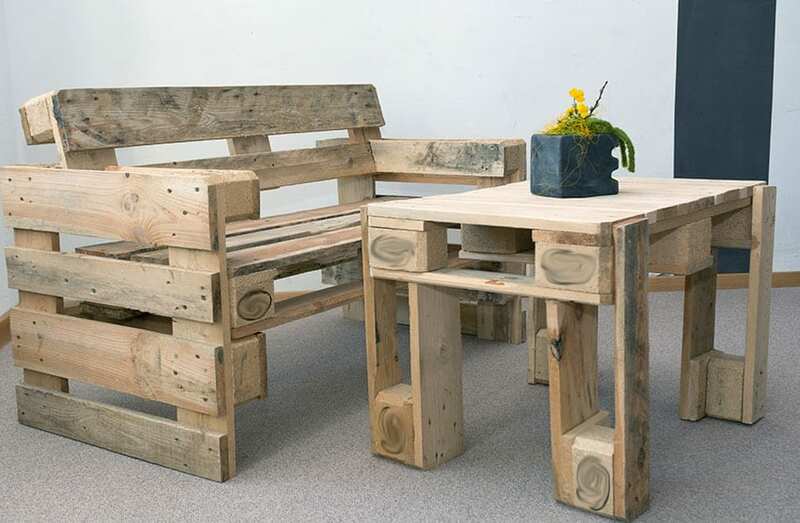 Wood pallets are such wonderful versatile material which can be repurposed as benches and tables. 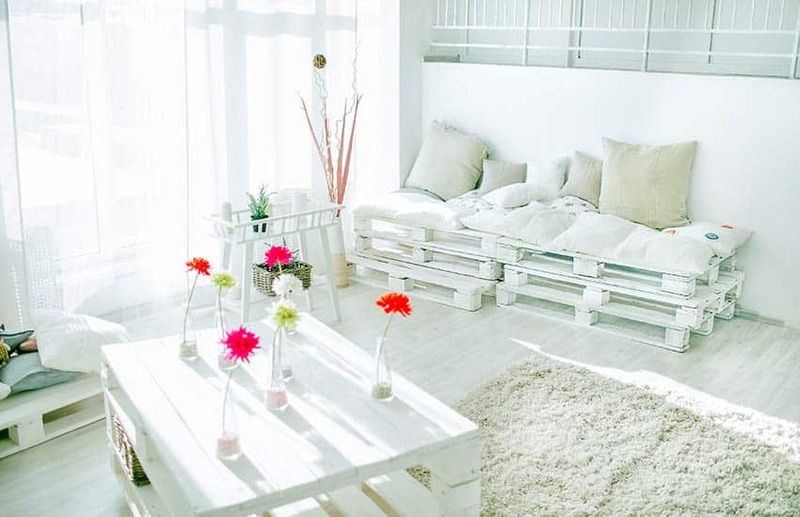 There are so much furniture ideas and inspirations which can be done by using these wood pallets. 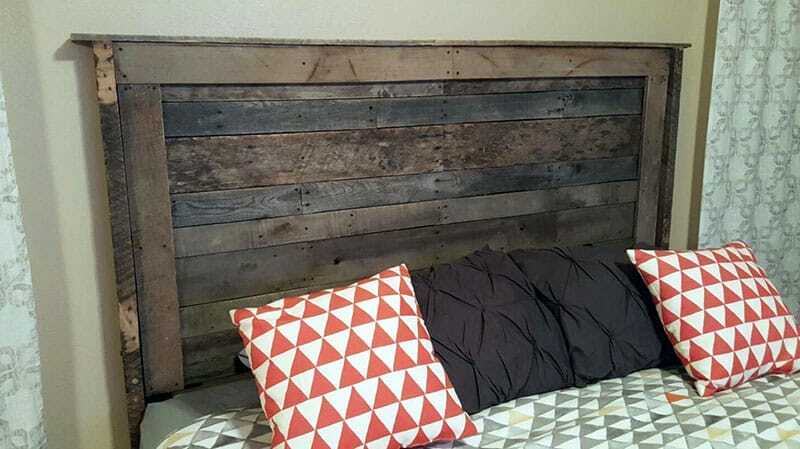 Here, are reclaimed wood pallet which are a given new life and purpose. 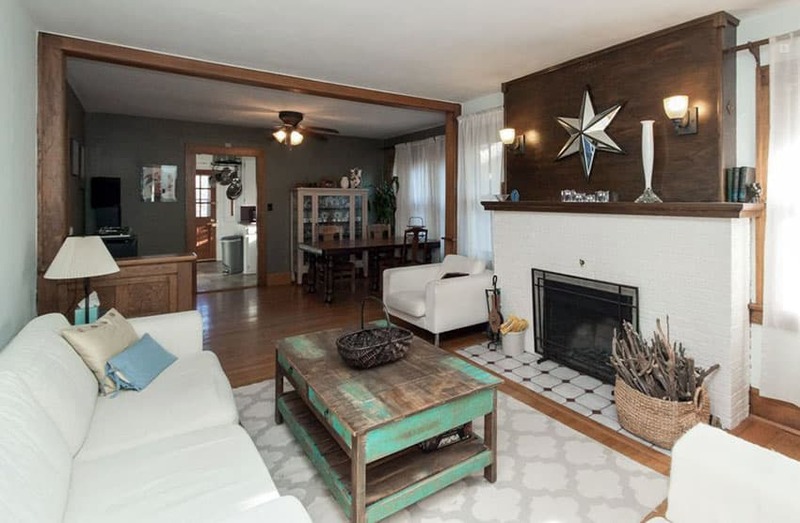 While they may look rough in this condition with the addition of colorful cushions for the chair and countertop for the table they can really come to life. All natural outdoor benches are constructed from reclaimed wood pallets are a fine alternative to the traditional outdoor living set. Colorful cushions add interest to the neutral wood finish. 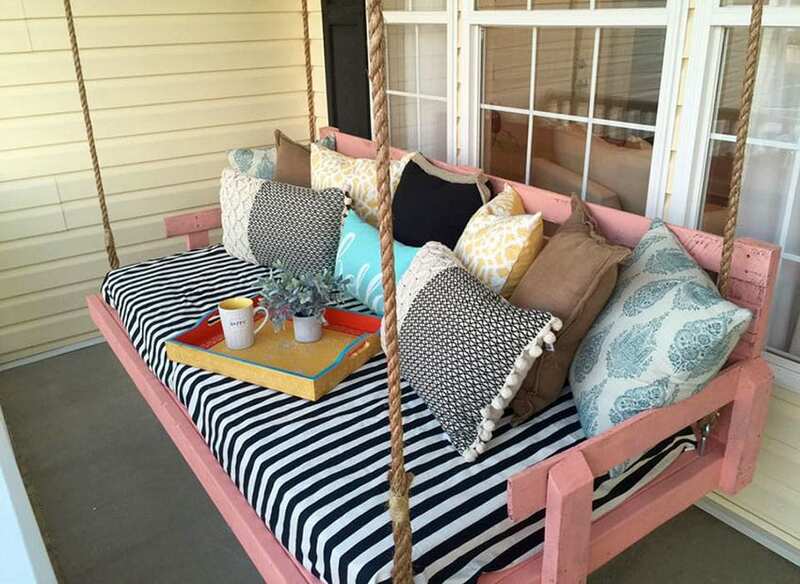 This simple DIY project creates an attractive pallet daybed out of several pallets, some paint and cozy cushions. 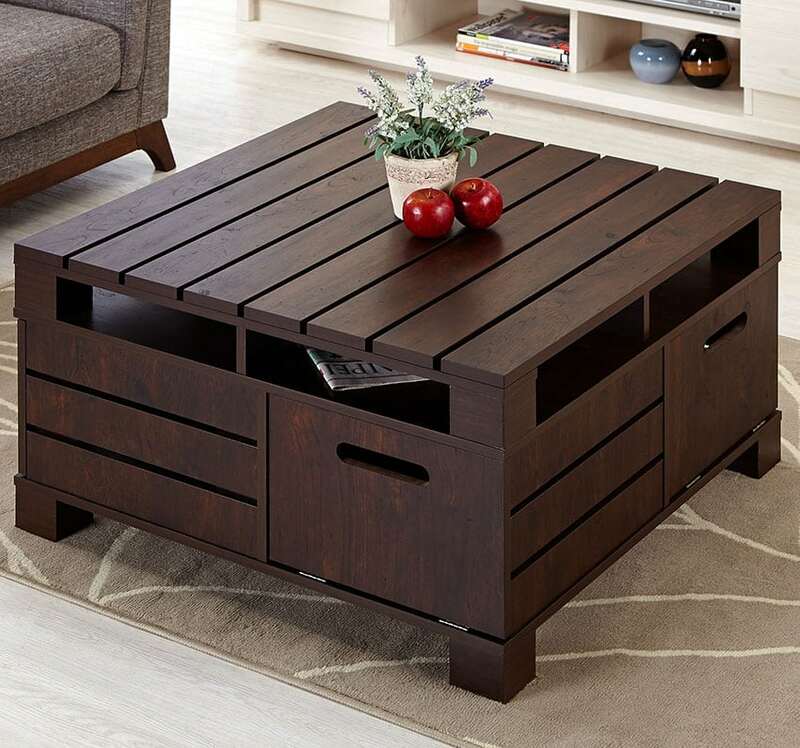 A matching pallet coffee table is the perfect compliment to this bright living space. 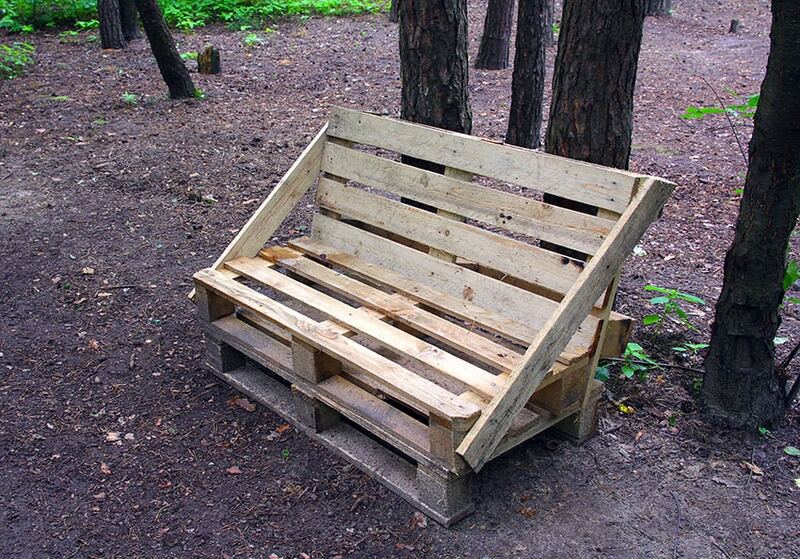 This rustic wood pallet bench is a perfect complement to this great outdoor setting. Perfect for relaxing after a long stroll through nature. 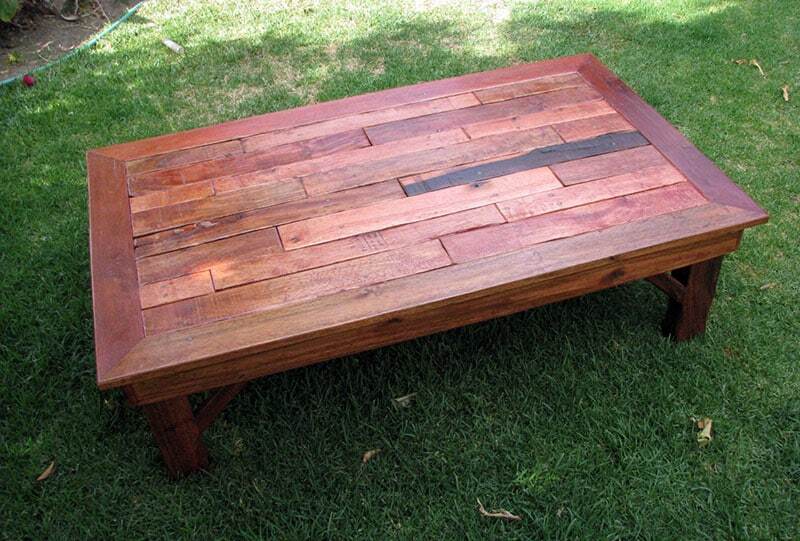 A pallet coffee table is a great way to get a rustic vibe in your living room. These tables can be found in a wide variety of designs and finishes to match your personal style. This living room has a DIY pallet coffee table that brings a rustic style to the space and won’t break the furniture budget. This stylish living room has a low pallet coffee table with wheels making it easy to rearrange the layout of the room any time you want. This wood pallet sign décor is such a unique piece of art coming from a very common wood material. 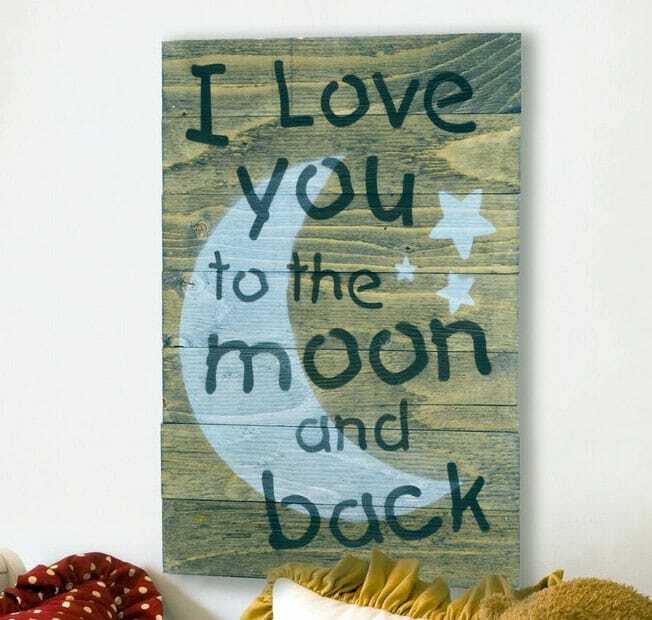 It is indeed such an inspiration which you will love to the moon and back. 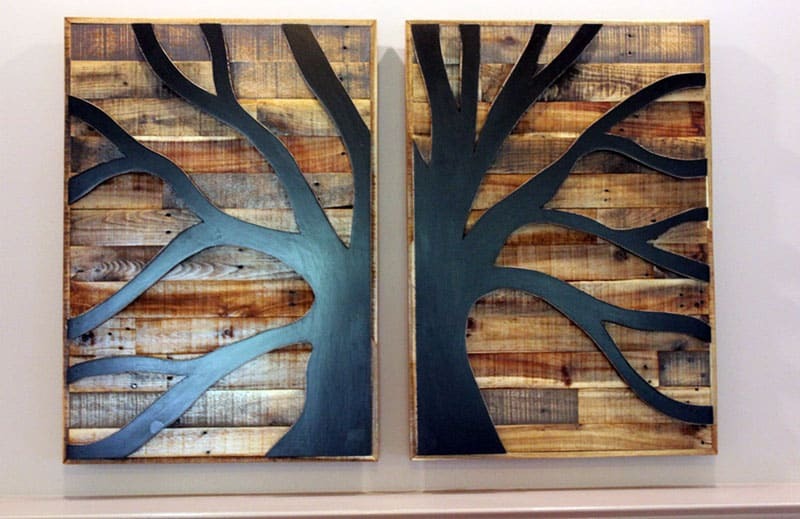 Not only does the wood pallets are used for furniture, this material is also being used for unique wall art designs. Repurposed wood pallets were sanded, varnished, cut into shape and painted to achieve both modern and rustic design inspiration. 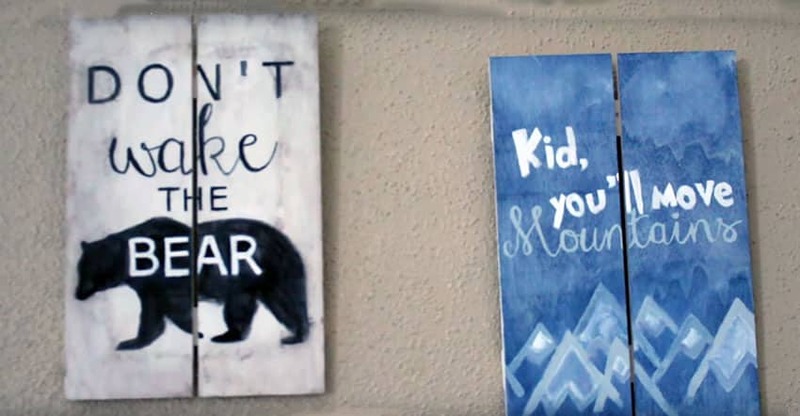 One way to make those little ones be busy on a long weekend or school breaks is to give them some DIY projects using wood pallet and turning it into wonderful wall art. This can also be a family bonding projects which are for good keeps. Create an original piece of art to show patriotism at its finest. 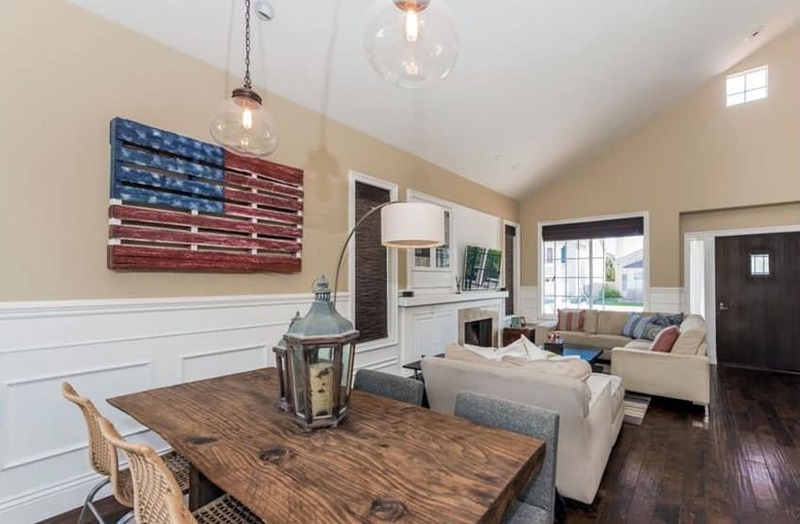 American flag pallet décor in this neutral color scheme living room creates a focal piece of red, white and blue. 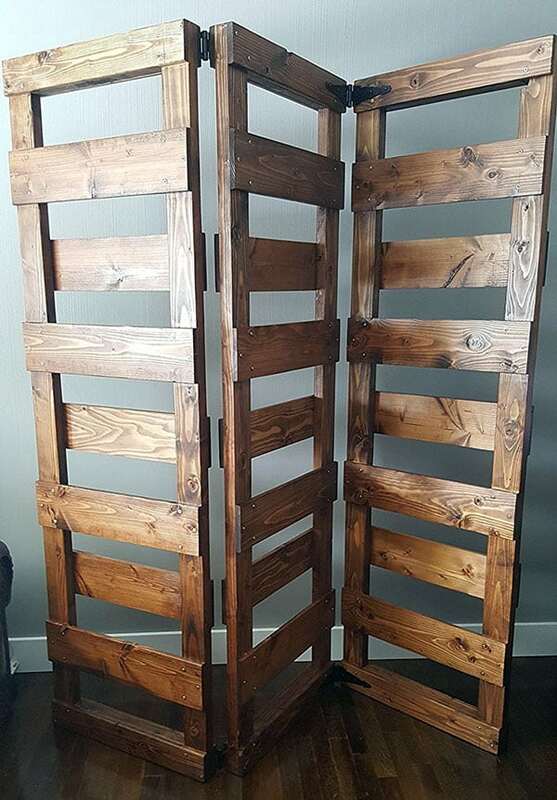 This uniquely customized wall mounted rusty wine rack is made of reclaimed wood pallet material. Made with a top shelf for wine glasses this DIY wine rack is a space saver, accessible, perfect for a special gift idea. 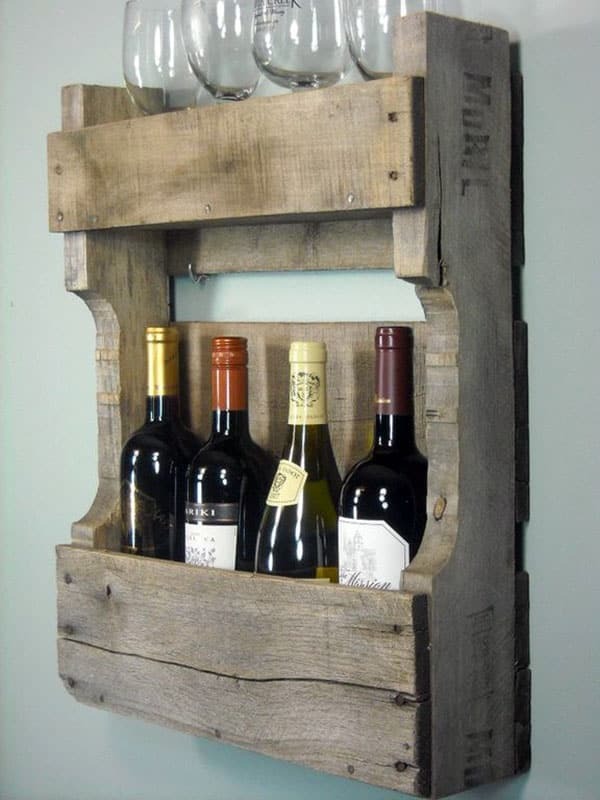 Customized wood pallet wine rack has three wine holders which can fit six bottles of wine in each holder. 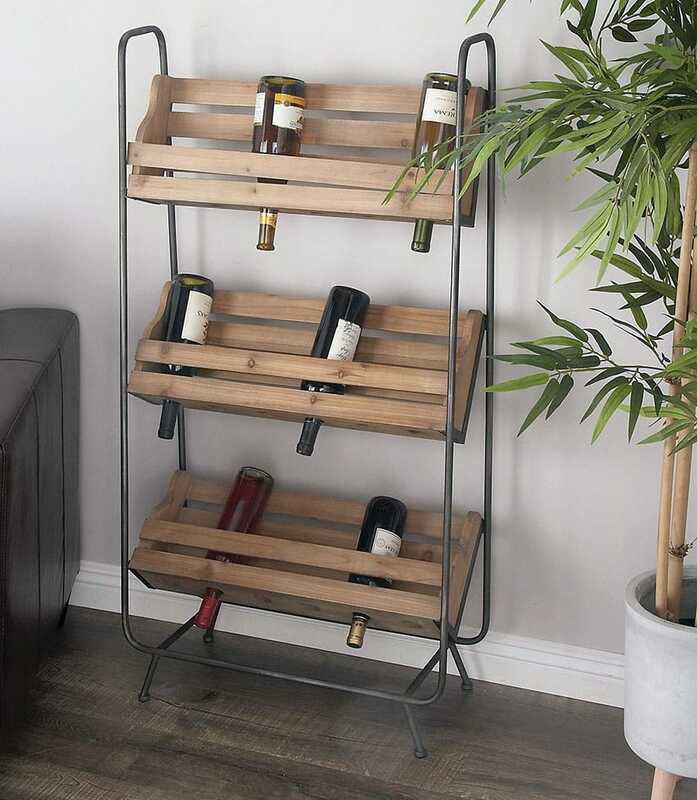 The metal legs and frame enable this wine rack to be placed upright for easy accessibility. Simple and sleek design is perfect for smaller spaces. This kid’s bedroom is perfect quiet place to relax and read a book. 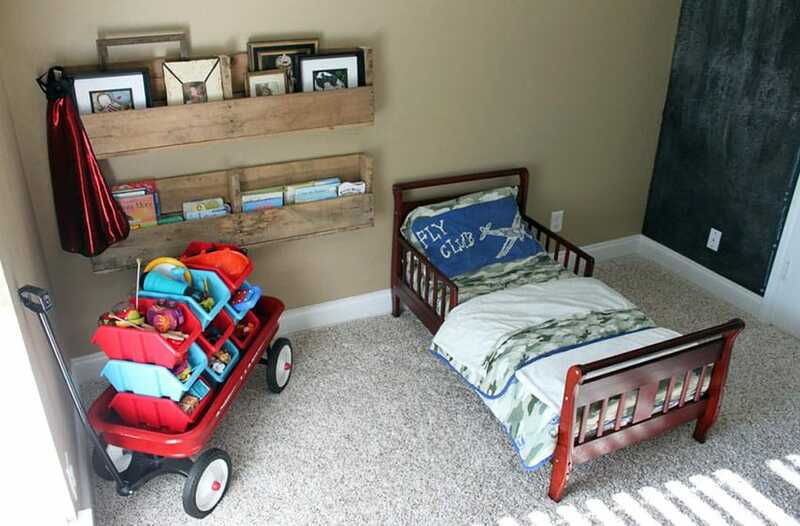 The repurposed wood pallet wall mounted book shelf is perfect for properly securing those best loved bedtime story books. 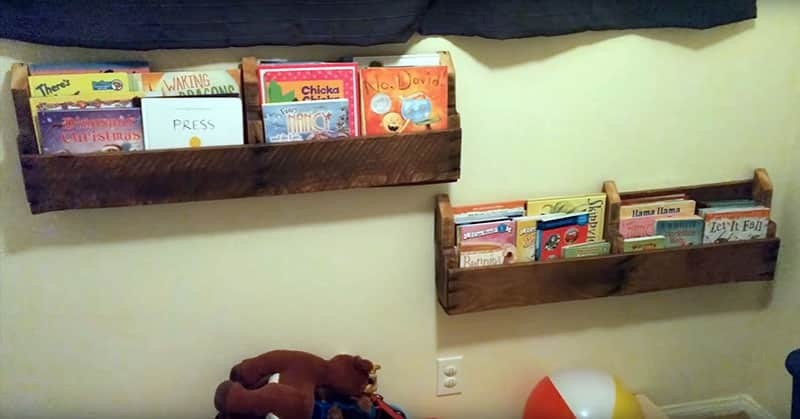 Reading is the best past-time for kids, make it more exciting in making them these wall mounted book shelves made from reclaimed wood pallet. It is also the best way to encourage kids on how to properly organize their stuff – hang these book shelves within your kids reach. 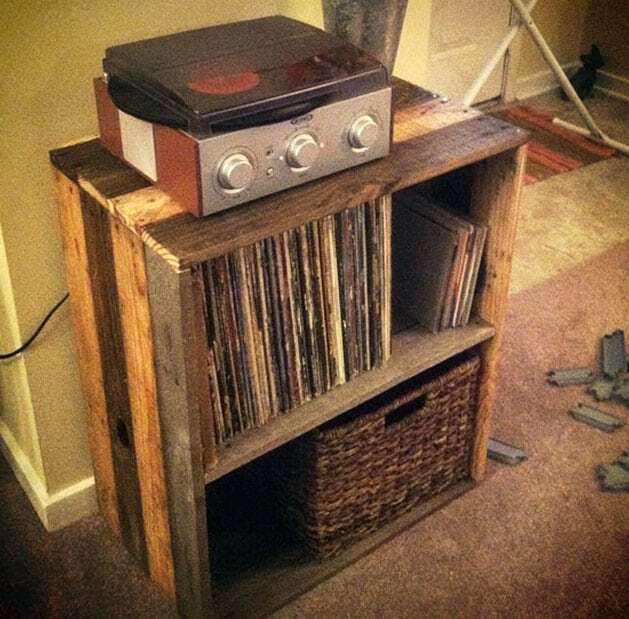 Give those old record collections a new “home” – repurposed wood pallet – sanded, varnished and transformed into a homemade rustic record stand. Now you can enjoy to those old-time favorites over and over again. 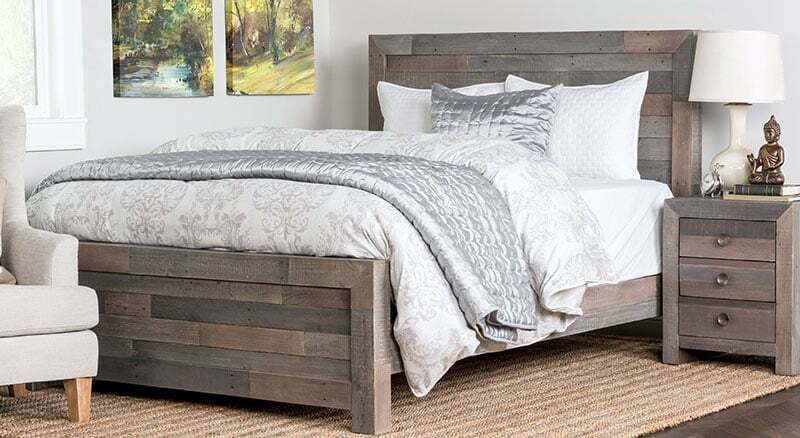 This stylish bedroom features a wood pallet headboard for the platform bed with matching decor such as the reclaimed wood spool table and pallet end tables. 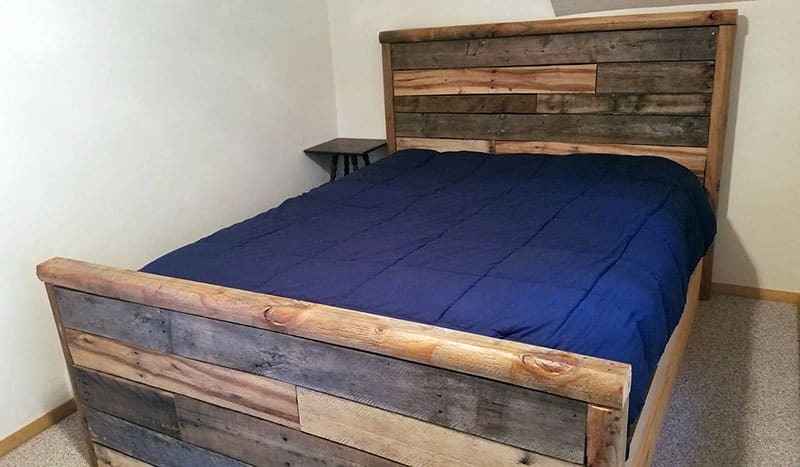 This bedroom set is made from reclaimed wood shipping pallets. It has a distressed finish to give it a distinctive beach style. 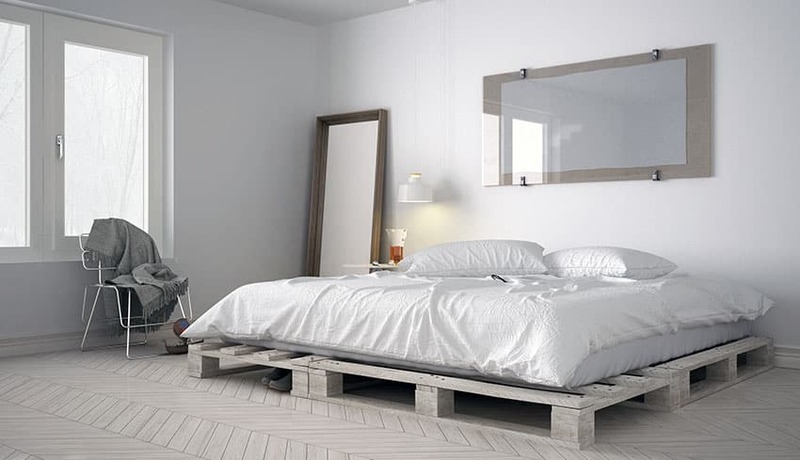 This wood pallet bed frame makes a suitable platform for a bed mattress and can look attractive when combined with modern minimalist decor. 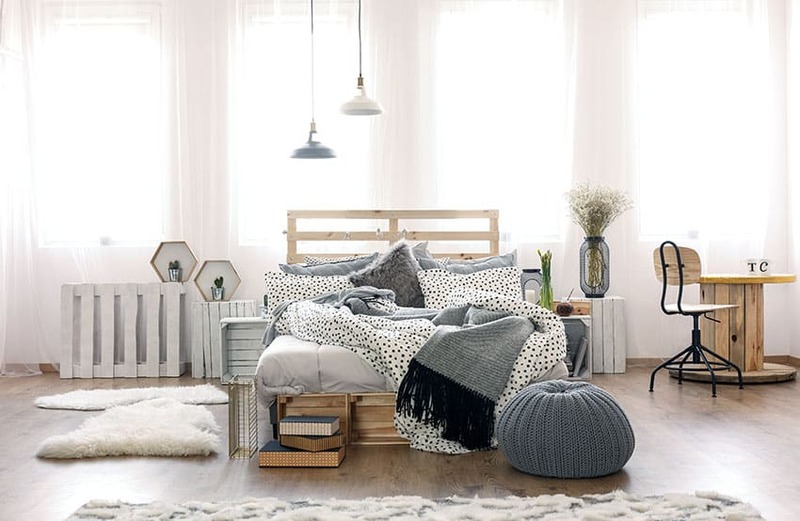 A pallet wall can give your room a rustic style and charm that is highly sought after today. Rough wood pallets can be used to accent hallways, bedrooms, bathrooms, living rooms, dining rooms, game rooms, mudrooms, kitchens and even kitchen islands with great results. 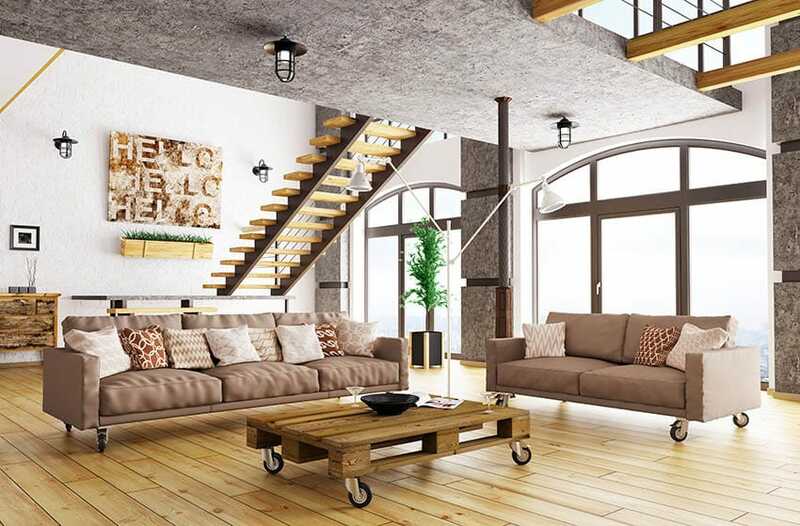 A contemporary living room with an awesome accent wall made of wood pallet is another design idea to give this living space a rustic character yet sophisticated style. 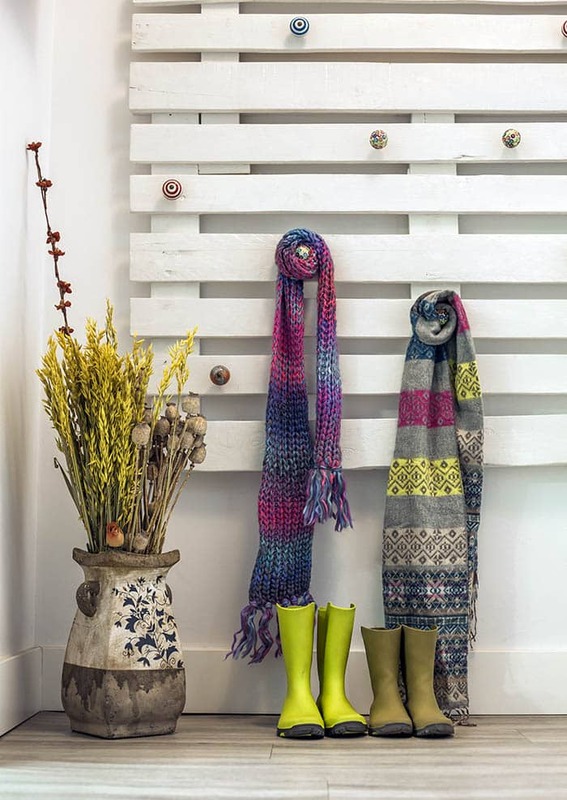 This simple wood pallet makes a great coat hanger for a mudroom with the addition of some decorative hooks and a little paint. 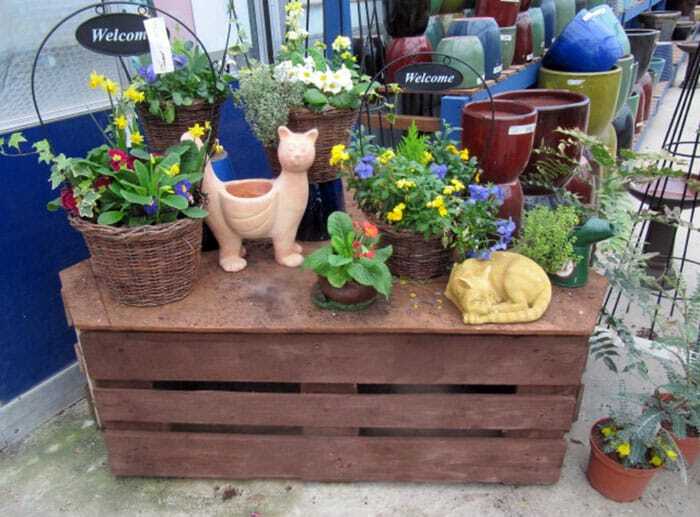 A wood pallet attached to an outdoor wall or fence can make a great flower box. 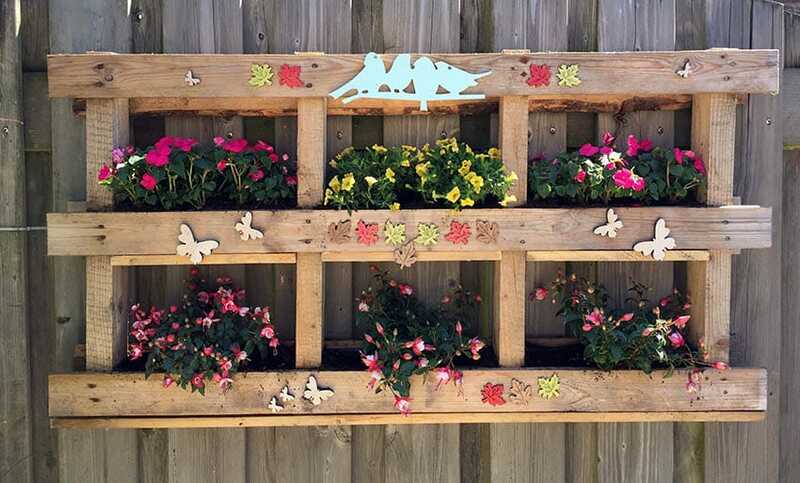 This wood pallet flower box is decorated with colorful leaves, birds and butterflies to give it a little more color and decor. 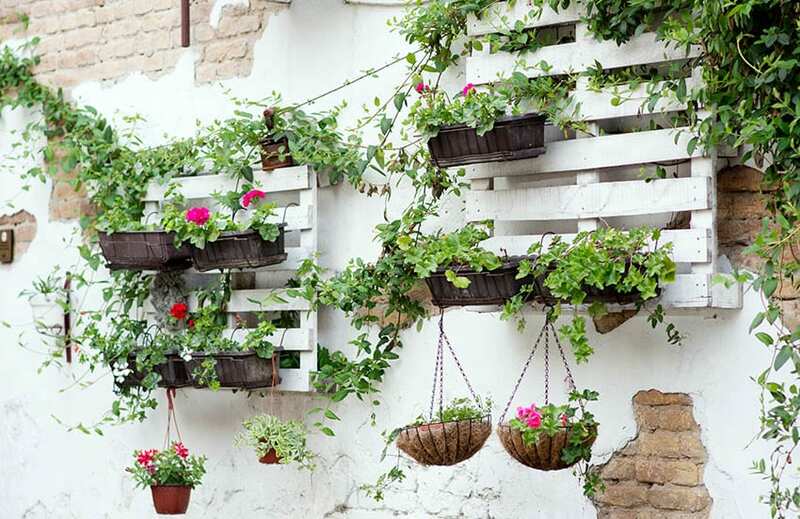 A great use for reclaimed pallets is to hang them on an exterior wall to act as the frame for your vertical flower garden. Decorated with climbing vines, flower boxes and hanging plants this wood pallet planter creates an alluring ambiance in a garden setting. A chic multi-purpose painted pallet planter chairs is another design idea which would work beautifully in your garden as an accent piece. 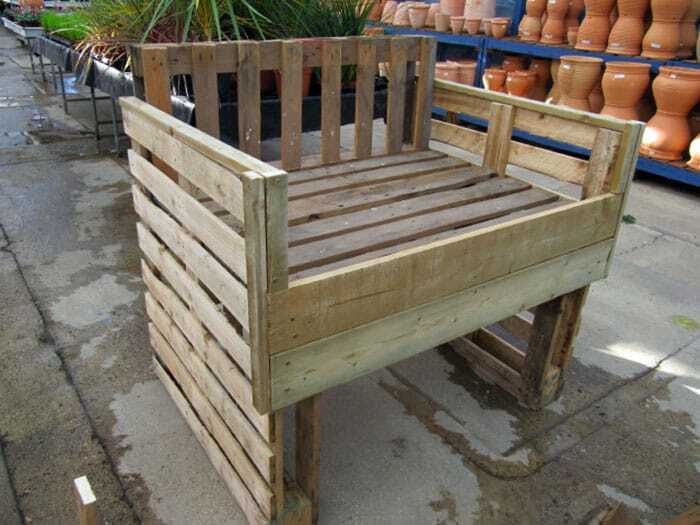 Two stringer wood pallet stacked together and painted to match the painted pallet planter chairs. 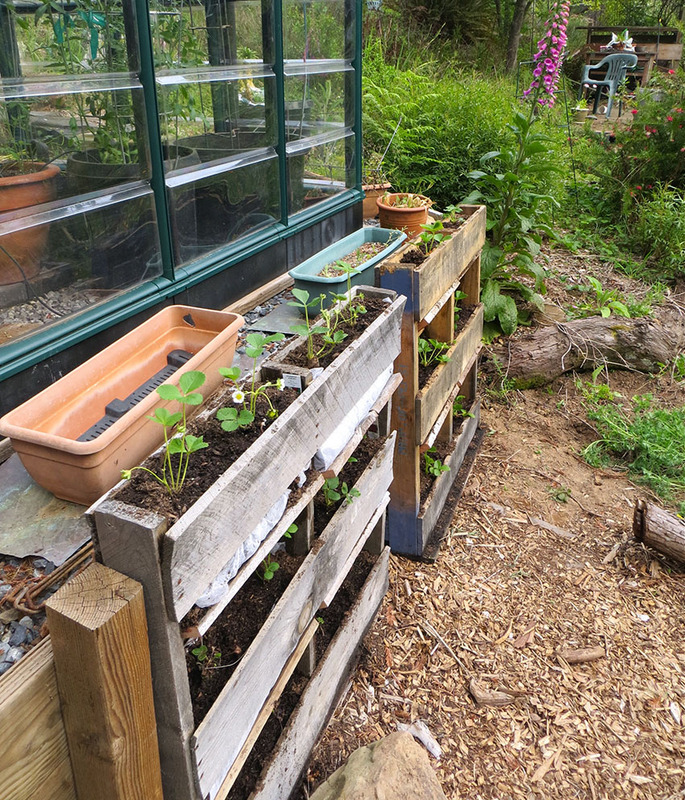 Very rustic vertical wood pallet garden planters are perfect to grow seedling by making good use of the spaces on their planks and can easily be divided into different portions. This reclaimed wood pallet turned into an outdoor table for plants is perfect for potted plants, flower baskets and other garden ornaments. 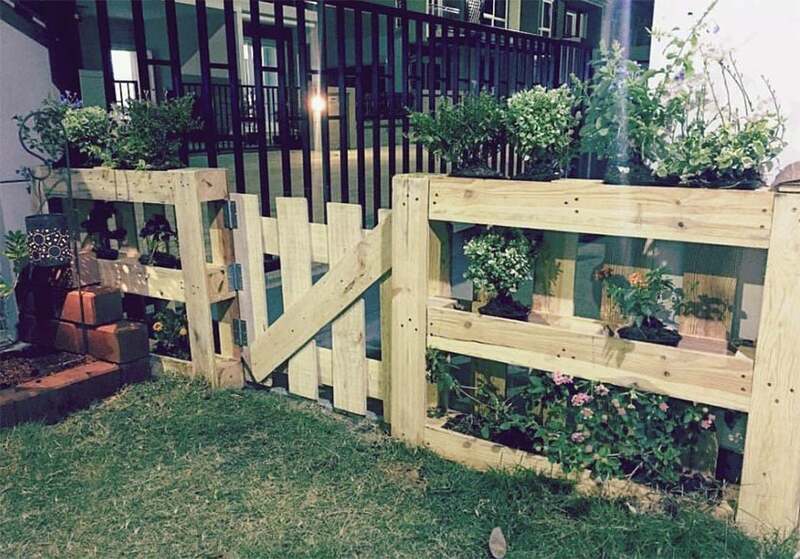 This reclaimed custom-made wood pallet gate in the backyard combined with a multi-purpose fence which is also used as a planter box adds more beauty to the homeowner’s garden. It’s natural stain and look compliments well with the green plants all around. 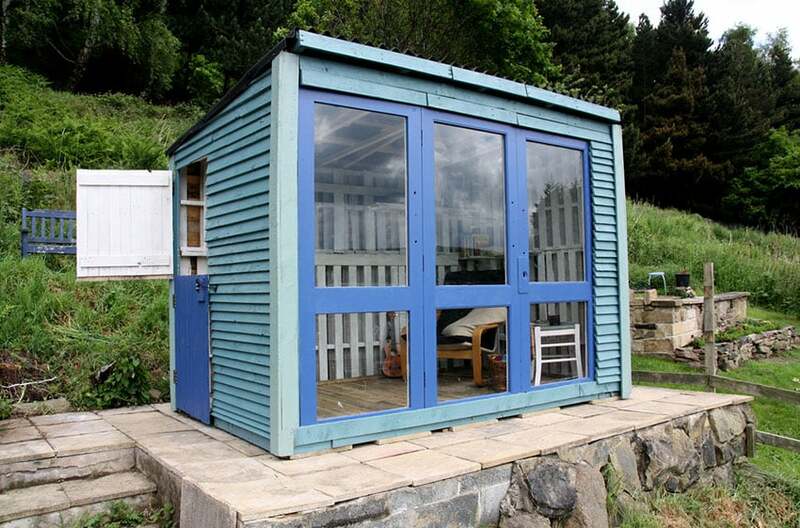 Perfect for a get-away retreat, this wood pallet shed is customized for a lounge area where you could relax and unwind. 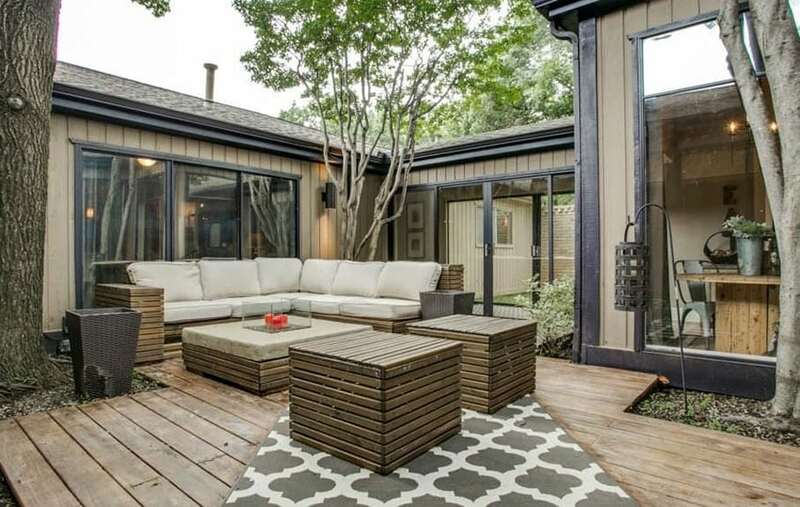 Built with floor to ceiling glass windows allows you to enjoy the beauty of nature all around. 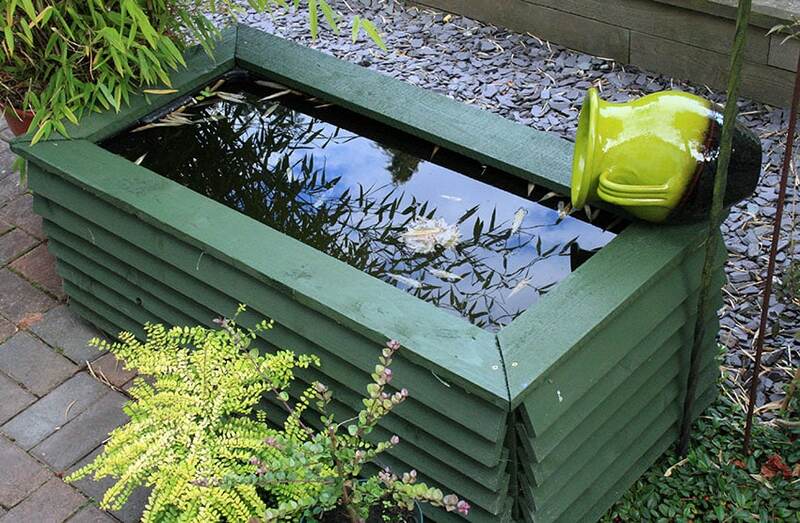 This DIY wood pallet water feature has all framework made with recycled wood pallets – a creative idea for reusing and upcycling the wood pallets.